(PhysOrg.com) -- Tropical sea cucumbers could play a key role in saving coral reefs from the devastating effects of climate change, say scientists at One Tree Island, the University of Sydney's research station on the Great Barrier Reef. "We have found that sea cucumbers play a vital role in reducing the harmful impact of ocean acidification on coral growth," said Professor Maria Byrne, the director of One Tree Island Research Station. "When they ingest sand, the natural digestive processes in the sea cucumber's gut increases the pH levels of the water on the reef where they defecate, countering the negative effects of ocean acidification," said Professor Byrne. 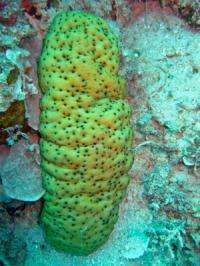 One of the by-products of the sea cucumber's digestion of sand is calcium carbonate (CaCO3) a key component of coral. To survive, coral reefs must accumulate CaCO3 at a rate greater than or equal to the CaCO3 that is eroded from the reef. "The research at One Tree Island showed that in a healthy reef, dissolution of calcium carbonate sediment by sea cucumbers and other bioeroders appears to be an important component of the natural calcium carbonate turnover," said Professor Byrne. "The ammonia waste produced when sea cucumbers digest sand also serves to fertilise the surrounding area, providing nutrients for coral growth," she added. The research, recently published in the Journal of Geophysical Research, was carried out by an international group of scientists from the University of Sydney, the Carnegie Institute for Science, Stanford, and several other institutions studying the impact of climate change on coral reefs. Sea cucumbers are among the largest invertebrates found on tropical reefs. Some 30 species are commercially harvested by the fishery industry along the Great Barrier Reef and throughout the tropics. "We urgently need to understand the impact of removing sea cucumbers and other invertebrates on reef health and resilience at a time when reefs face an uncertain future," Professor Byrne said. On a coral reef dive, I saw one of the creatures. Amazing. Just jaw dropping how colorful they are.